Who says you need to go out to dinner to have an international flavor at home? Celebrating the Chinese New Year at home actually is one of the quickest meals you can make at home once you have assembled all the ingredients. No worries we are not going extravagant here, just a simple Chinese New Year Stir Fry Recipe. 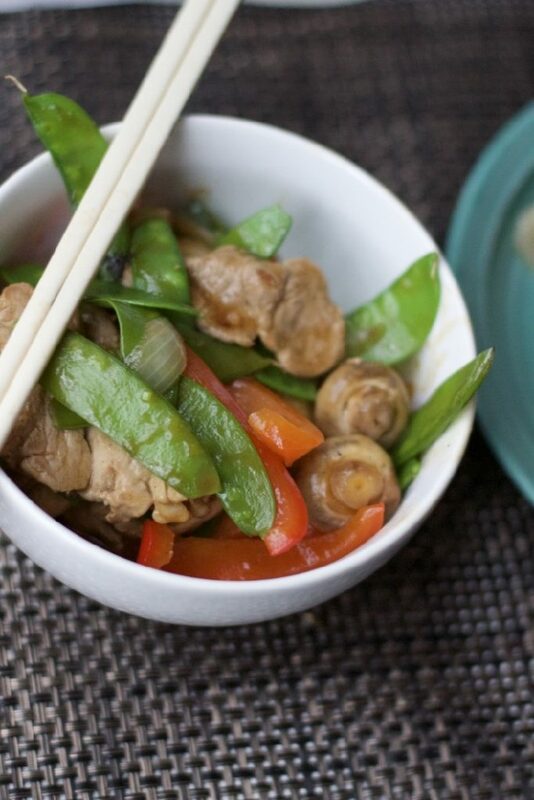 Stir fries are great weeknight meals that include protein and veggies in a one pot dinner. 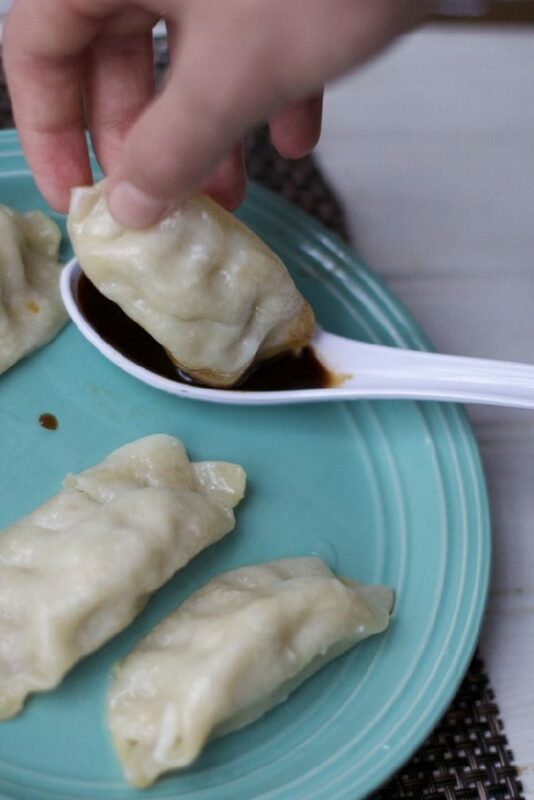 You can also add potstickers as a side in under 10 minutes for even a more special dinner. 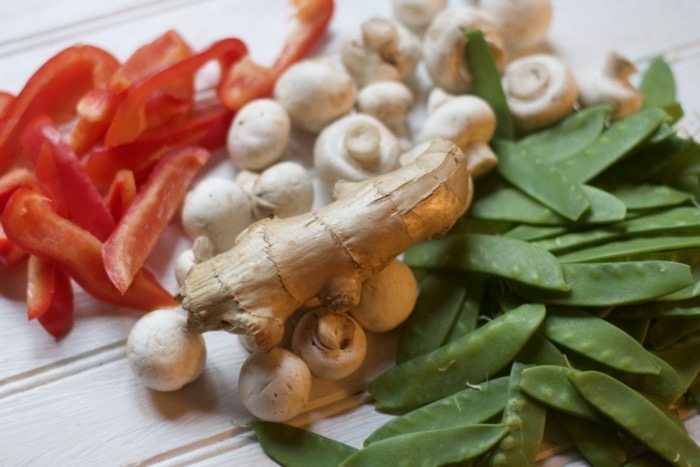 Our family loves stir fry and has tried many recipes and flavor combinations over the years. So much I need a new Wok. (we had a nonstick one and I will not do that again!) No worries if you do not have a wok at home, I used a large saute’ pan for this recipe and it worked just fine. I found a recipe for Chinatown Chicken Simmer in the coupon section of the Sunday newspaper several years ago and have been adapting the veggies and proteins over the years. Stir Fry Recipes make eating Chinese food at home so much cheaper and it is always well received by our family. We used pork tenderloin this evening, but chicken thighs, chicken breasts, tofu or flank steak all cook up super fast as well. Start by browning the meat on both sides in a little oil. Then remove to a platter while you cook up the veggies. 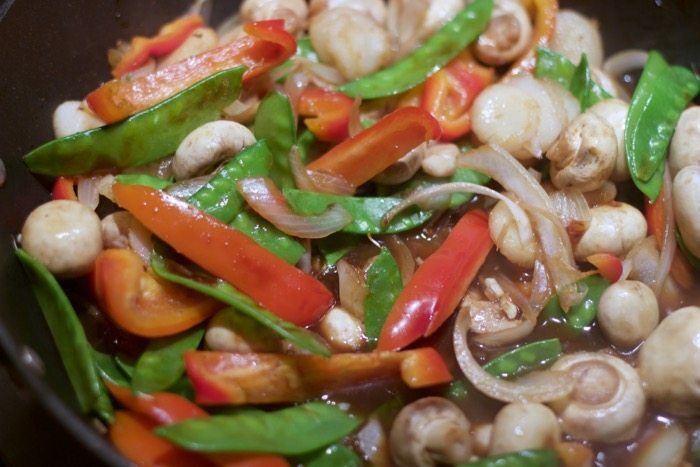 Use a combo of all your favorite stir fry veggies, we used red peppers, mushrooms, onions and snow peas. 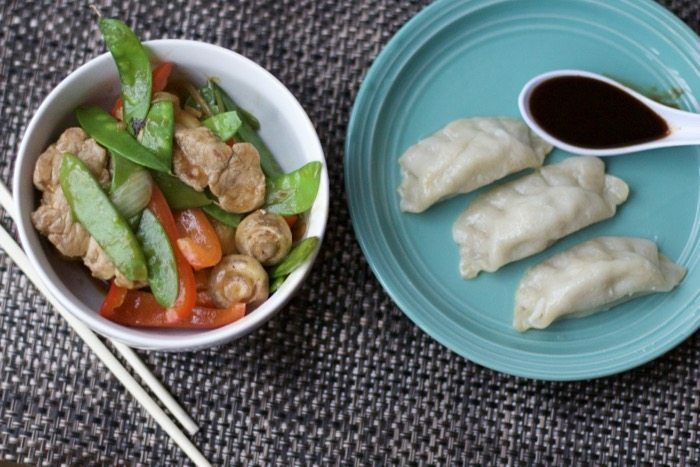 Once you finish off the veggies, make a pan of Ling Ling Potstickers. They come with Ling Ling signature dipping sauce for a super easy side dish or appetizer. 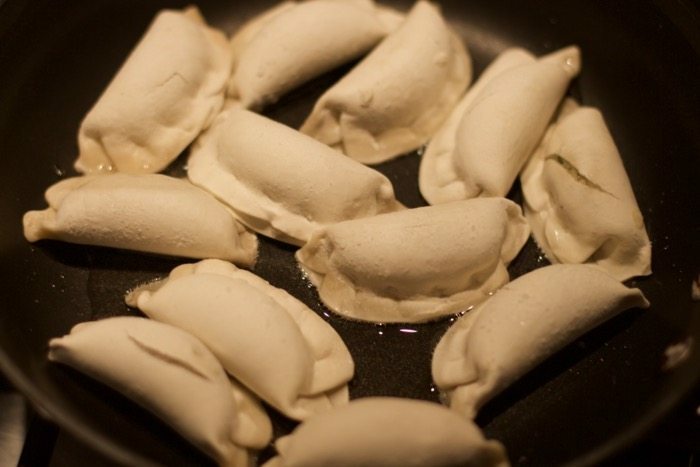 Simply lay them in a non-stick pan filled with a little oil and water and cover and wait for them to heat through. My kids could not wait for the rest of the meal to be served to dig into these delicious pot stickers. 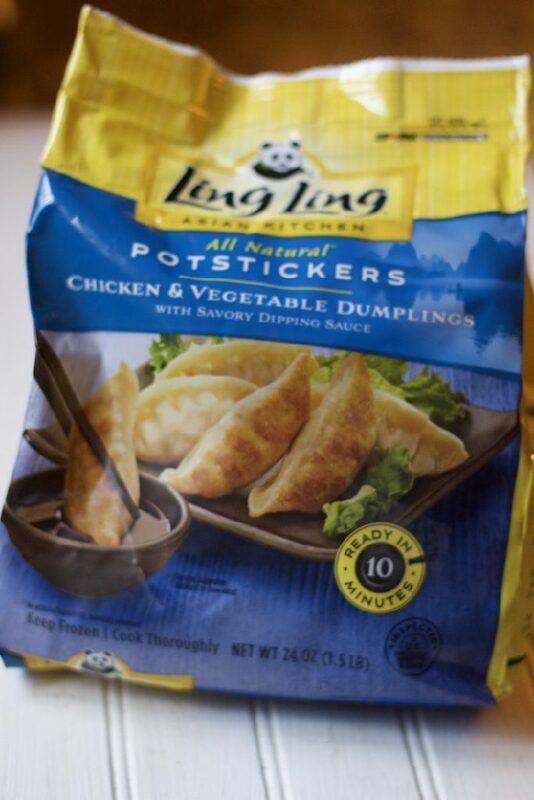 These Ling Ling potstickers can be found in your grocer’s frozen food section are made with delectable chicken or pork, and tender vegetables expertly combined in a mouthwatering dumpling wrapper. 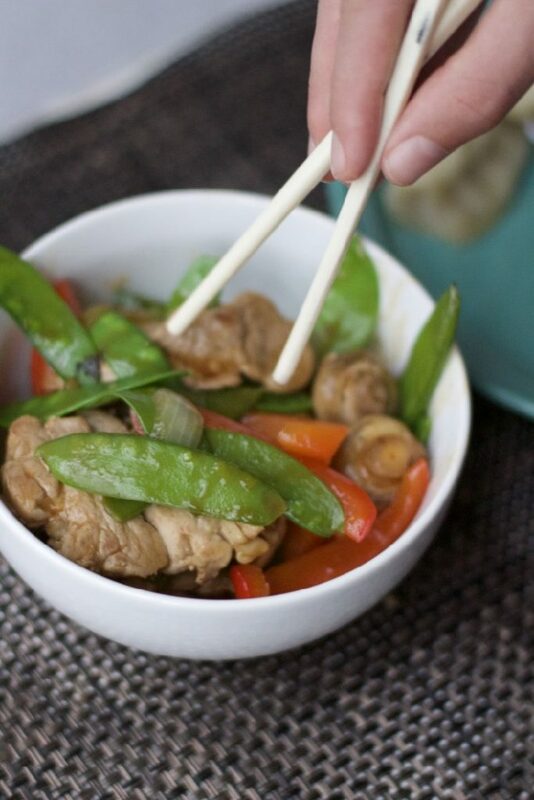 Serve your stir-fry with a bowl of rice and some chopsticks in honor of Chinese New Year. 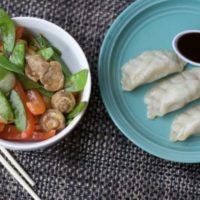 Chinese New Year Food does not have to be complicated just a fun excuse to change up your dinner menu. Besides serving Chinese New Year Food, here are some fun traditions for Chinese New Year: If you celebrate Chinese New Year I wish you a wonderful Celebration!! Refrain from using foul language or bad words on New Year’s Day or they will follow you throughout the year. No sweeping on New Year’s Day as you’ll sweep all your good luck out the door. Stepping into new shoes on New Year’s morning to start your year off on the right foot. 1/4 cup oragne juice with cornstarch; set aside. Heat large skillet over medium-high heat; add oil and chicken brown for 5 minutes. Place on a plate to rest. Add garlic, bell pepper, onion and ginger to pan and saute 3 minutes. Add snow peas, chicken broth, soy sauce, hoisin sauce, cinnamon and honey. Cook for an additional 5 minutes. 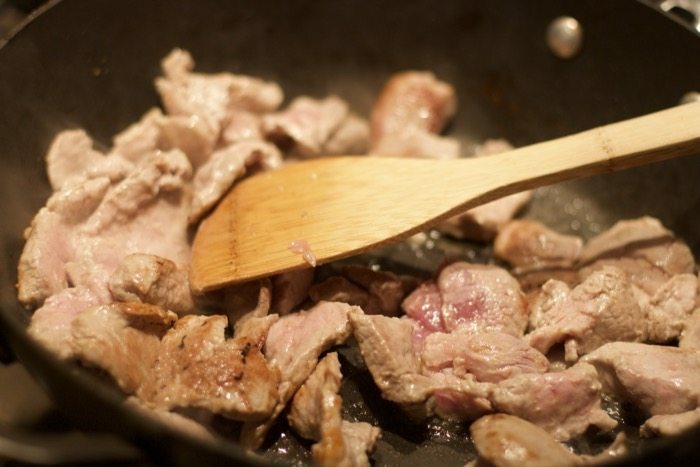 Add the pork back into the pan and add the OJ and cornstarch mixture, cook until the sauce thickens. Serve over rice. What is your family’s favorite stir fry combo? This looks wonderful! I love all of the fresh ginger in it! Wow, so quick and easy! Would never have thought about putting cinnamon in it. Genius! I love a pork stir fry, but I’ve never made it at home. Will have to try your recipe! Oh my goodness I love these pot stickers!! I’m going to have to try your recipe with them!